I retired in 2002 after a lifetime in transport and distribution, starting as a driver’s mate and driver, retiring as a national operations manager. 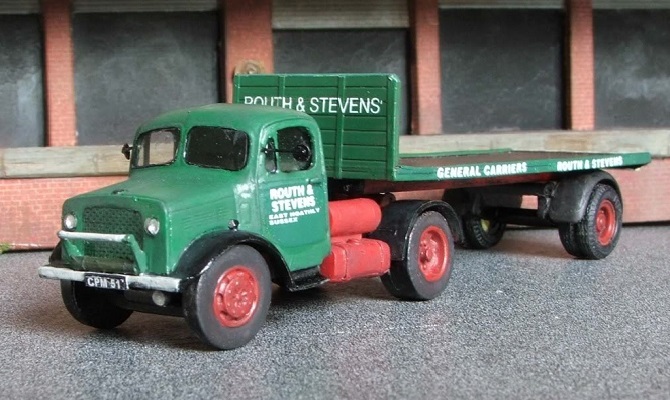 This is an extension of a hobby I started in the late nineties, purely for nostalgic reasons, to recreate lorries I ‘d driven and / or operated, or ones I could recall from the “good old days”. I started scratch building models for my own needs, which I couldn’t buy as kits or Diecast models to convert and the current range has developedfrom this, since 2003. The range is a modular building system made as simple as possible, by using a minimum number of components. All of the cabs consist of two parts: complete cab shell and interior, plus steering wheel and appropriate style fuel tank for the cab type. Chassis are also two parts: chassis rails and rear mudguards, plus underside transmission, including axle beams and dif. to hold the axles in place. A range of white metal wheels is available to suit all cab types. An increasing range of bodywork is available, plus a selection of loads to replicate a lorry “earning it’s keep”. All cabs and components can be built as a complete vehicle, or you can just buy individual items, such as cabs, bodies, wheels etc. to convert or improve EFE, Trackside and other kits you may have bought previously. An increasing range of water slide transfers and registration numbers (with an option to have fifty sets made to your own requirements) are also available for super detailing. The objective is to take the masochism out of modelling. Half a dozen components and you have a rolling chassis/cab. We have made the price list as easy to follow as possible. First listed is the range of cabs with cab prices. The next column to the right indicates the chassis(s) that will fit each particular cab; the third column is the wheel set to suit the vehicle type. The prices for chassis and wheels are priced under the appropriate headings. If you are a model collector as opposed to a modeller, we can now offer a bespoke building service to a very high quality. Please contact Chris Staniland by telephone 01670 712 698 or by email to c.staniland@talktalk.net for a quotation, indicating to him the model you want built. It will then be necessary to buy the modules for the model you require, plus any transfers and accessories, which are delivered to your home address for you to post on to Chris Staniland. Bodywork is also available, mostly one piece, ready for painting. Against each body type is shown the price and the chassis it will fit. Finally, add up the cost of what you require, fill in the order form, add the required amount of P&P and send both copies to the address on the price list. The accompanying illustrated sheet, in all instances follows the sequence of the price list. All images give the cab code for easy recognition, with many showing chassis, body and wheel codes. The range is updated with new models introduced in January, April, July and September, usually with an equivalent number of items withdrawn from the list to keep it fresh. Deleted models then transfer to the “Archive List”, then cast to special order at a £2 premium. Offering J 00 different cabs available from both lists. We attend a number of model and transport exhibitions throughout the year, with advance notice being published in the Update. Our show stand has examples of all current items on display with stock available for sale and over 100 fully assembled and painted models on display. We’d be pleased to meet you to explain our range further. We hope this has further fired your interest and look forward to receiving your first order. Please note orders are only accepted on the enclosed order form. A further blank form is sent out with each completed order.